and an odd item discovered under the sand. Hurricane Irma the most powerful Atlantic storm ever recorded slammed into the space coast causing massive coastal erosion. 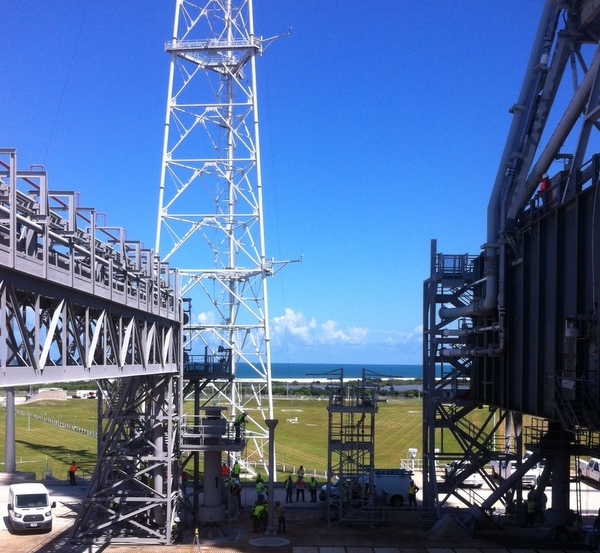 On Kennedy Space Center great effort was given to restore the dunes. 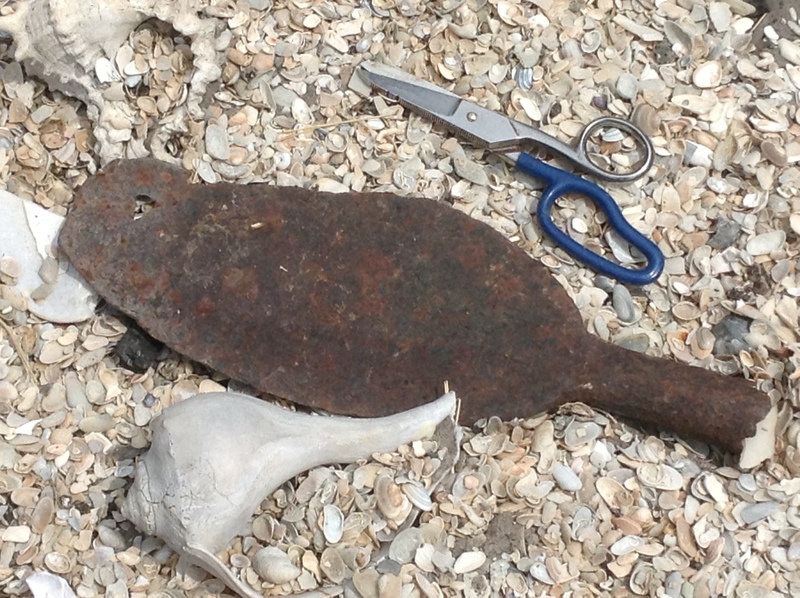 An odd item was discovered under the sand. 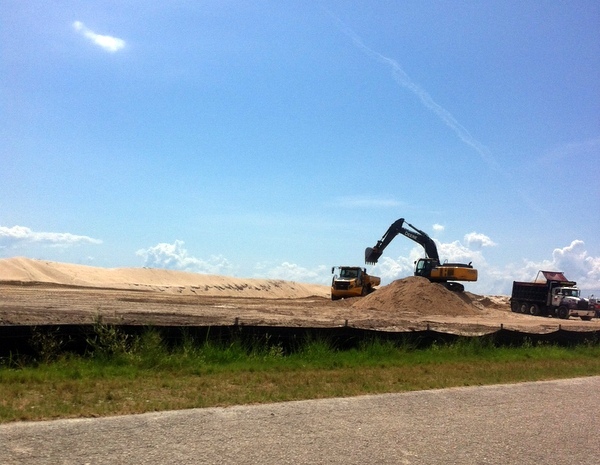 Received a phone call to come out on the beach where dune restoration was being completed. "Cut your power cable?" I asked while checking the clock. "Again." "Yep, cut the ........ out of it. They are pulling the railroad ties off Phillips Parkway and exposing all kinds of stuff. You might be interested." I was aware that NASA was restoring the sand dunes damaged from Hurricane Irma but of course had no idea 'miles' of beach dunes were being restored. But then Hurricane Irma was a wicked storm. 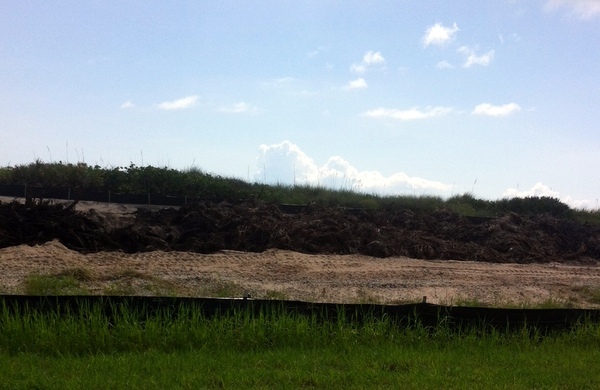 Drove past piles of reclaimed railroad ties and wove around dump trucks full of sand. Jean Ribault I muttered to myself observing the bulldozers pushing sand across the tattered remnants of hurricane damaged dunes. What of any Ais Indian artifacts on the dunes I pondered. Or Spanish coins? 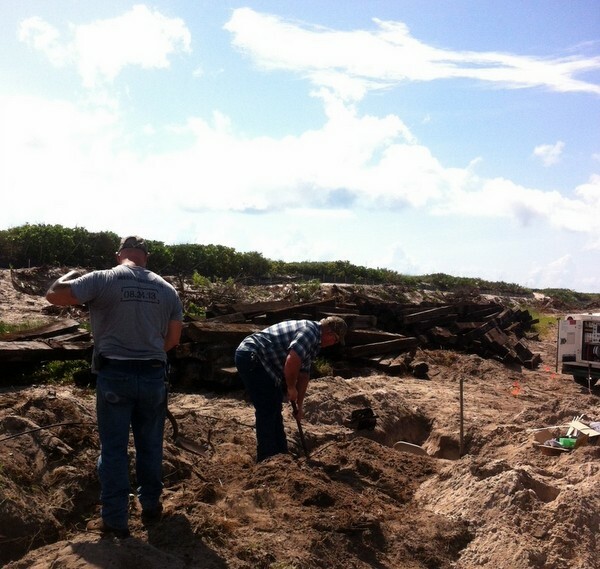 Eleven silver coins had been discovered only a few miles north on Canaveral National Seashore. What of the Jean Ribault archeological site where the desperate shipwrecked French had rebuilt two hurricane wrecked ships? I contemplated this as I drove up to the cut power cable. Guess someone had been wrong about the location of the French site and it was not on this stretch of beach. 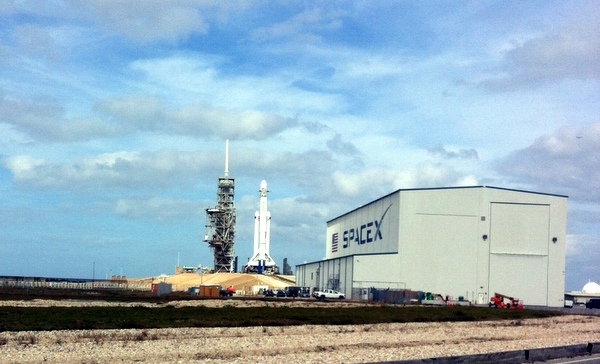 Sort of odd because I had read about the archeological site located on this stretch of beach east of Launch Pad 39B. The information had come from a NASA web page bragging about the previous dune restoration after Hurricane Matthew visited the space center. Then the thought hit me-The exact location-of the Frenchman's desperate ship would be GPS recorded and covered with sand for protection of both hurricane and burrowing gopher tortoises. There was the electrical crew repairing the buried power cable-I supposed the cable fed the ranger stations and remote tracking sites on Canaveral National Seashore-a favorite kayak spot. "Look what the root rake exposed" said my buddy. 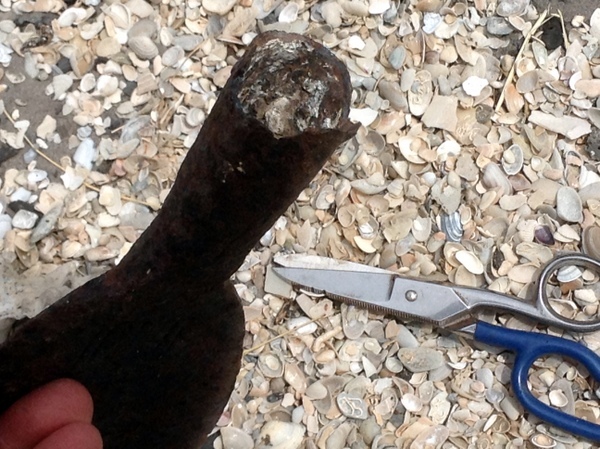 I squatted in the sand and inspected a rusty object "What is that? A hoe? A spade?" The item Appeared to be a rusty broad knife however the handle or grip was socketed to fit a wood handle in the same fashion as a spade or hoe. "Yeah we don't know what it is, that's why we called you." "A little shovel like the army uses to dig foxholes?" I said doubtfully. Still thinking about a spade. "It has Roman numerals stamped in it-or something, old letters." I took several photos with my phone, puzzled but enjoying the puzzle because I had never seen an implement of its like. "Looks like a wide tipped spear-a fat spear point" I said chuckling to myself. When was the last time anyone used a spear in Florida? Even the Spanish had matchlocks or flintlocks. The French wrote about their harquebus guns. The "beep-beep of a backing sand truck only briefly interrupted us. At last I recalled the word-remember having read it but never thought to pronounce it. I took a last photo and stood up my thighs screaming at me. "A halibut....no a halberd! It's a halberd" I said with wonder. "A fat spear"
The power guys looked at me with polite doubt. They were being super nice-not always the case with this crew but I suppose one guess was as good as any. The truck dumped its load of sand, where was the sand coming from I briefly wondered. "Were are heading to the MFF cafeteria to get some chow while they test load this cable" said my buddy. "Yeah I have to get back to the office. Put a cone over that thing and I will call the environmental-historian folks after I find their phone number" I said and headed back-having forfeited my lunch break. "Halberdiers" I said out loud during the drive around sand filled dump trucks. I recalled that word from Hernando de Soto's invasion of Florida. Soto himself had used the word "halberdiers" - a term I had never even heard of before reading the Spanish account of the ill fated Florida expedition to find riches grander than the Peruvian empires. Where had that thing come from? A random ship wreck? 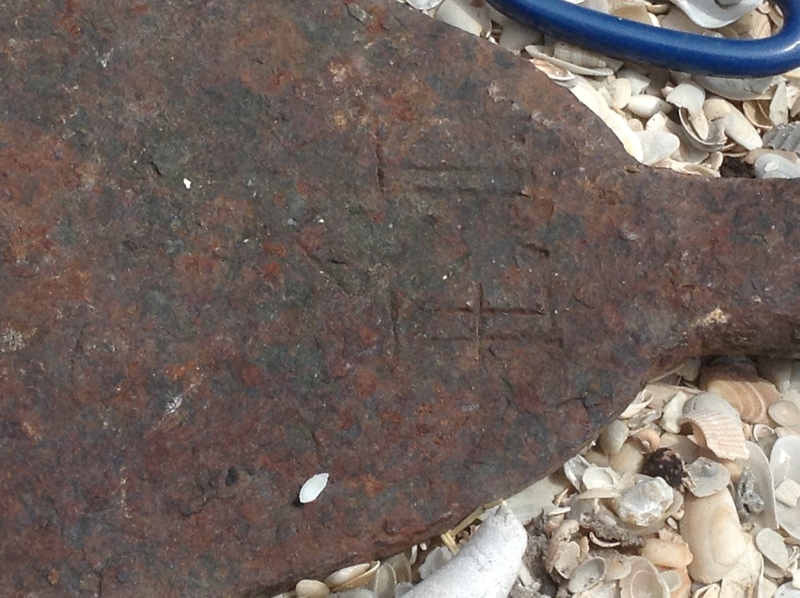 Could it be an artifact related to the Jean Ribault site? Or more recent like the Second Seminole war? When I got back to my office there was message on my desk phone -light blinking. "Don't bother calling environmental" drawled my buddy's voice. 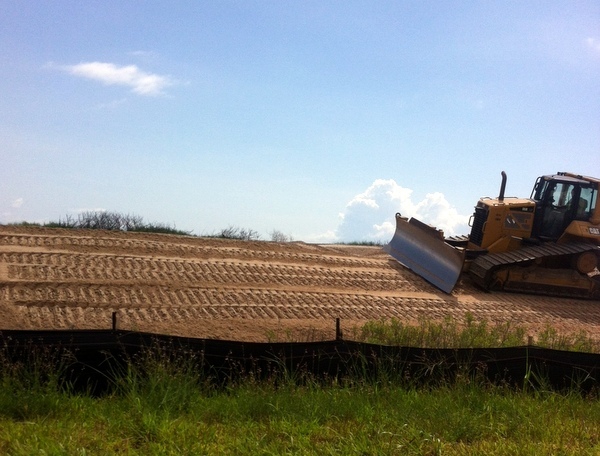 "While at lunch a front end loader graded over the area except for the cable splice pits. Your halibut thing is buried again." The orange warning cone? I did not ask out loud. "Alright, well it was probably an Army spade from building WWII coastal defenses like the one up on Canaveral National Seashore" I grumbled-still hungry. "Hey call me again if anything else pops up!" "Bummer" I muttered hanging up the phone and reviewing the photographs.